1. If he were not suspended, and if he hadn't put his character up for discussion, the world would be raving about what Jameis Winston has done this preseason. He's hit 30 of 41 passes for 398 yards, three touchdowns and no interceptions. Instead, Winston came to the podium Saturday night, and there were no questions. See you in a month, Jameis. 2. 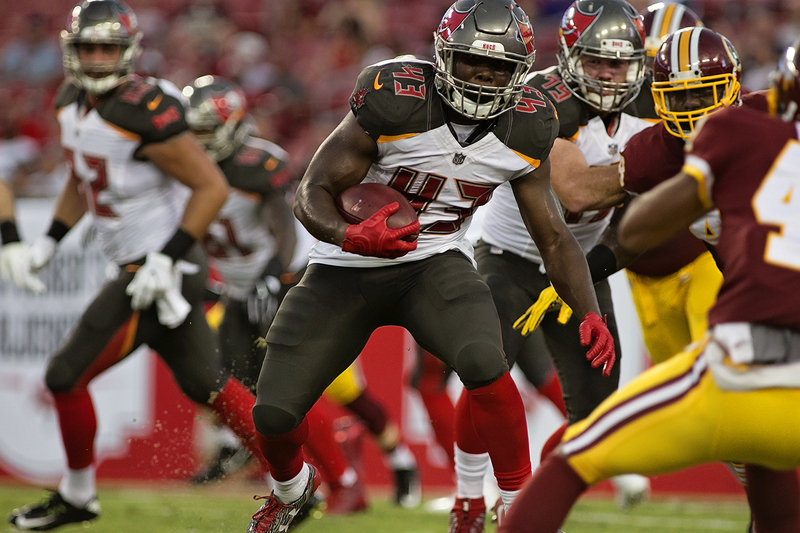 Is Peyton Barber growing on you as a running back? 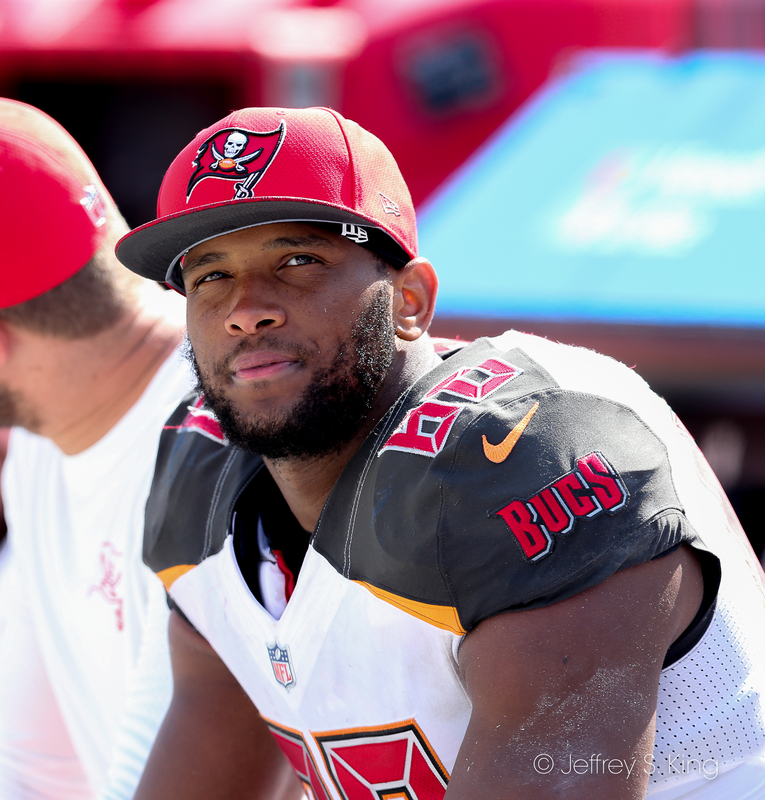 More and more, he reminds me of Earnest Graham, another back who came to the Bucs with little fanfare and then contributed mightily. Barber won't dazzle you with wiggle or awe you with speed, but there are more backs who are worse than him than are better. 3. This occurred to me about the Bucs' sometimes-wobbly kicking situation. If you remember, Dirk Koetter said that Vita Vea was hurt after being kicked. Considering that Vea has been out a month, maybe the Bucs should find the guy who hurt Vea and get him to kick. 4. I don't know what Adam Humphries jersey sales are, but they should be higher. 5. The secondary still lets too many receivers run free. Think the Saints might notice? "Don’t let the final score fool you. It was the Detroit Lions’ backups who delivered an impressive comeback win, 33-30, over the Tampa Bay Buccaneers Friday in a preseason matchup where the Lions’ starters struggled on both sides of the ball. After thunderstorms delayed the kickoff of the nationally televised game an hour, Detroit's starters disappointed in the contest many consider the dress rehearsal for the regular season. The Bucs won the toss, and like a knife through hot butter, moved effortlessly down the field with the opening possession." "Matt Patricia has covered every base imaginable in his bid to have a good situational football team, including the rare returned-field-goal-for-touchdown that burned the Detroit Lions in Friday’s preseason win over the Tampa Bay Buccaneers.The Lions walked through the play during joint practices with the New York Giants two weeks ago, and last week Patricia showed his team a clip of Auburn’s dramatic “Kick Six” game-winning return against Alabama in 2013. “Pretty much came back to get me on that one,” Patricia said. The Lions sent Matt Prater out for an ill-advised 62-yard field-goal attempt on the final play of a rainy first half Friday at Raymond James Stadium, and Tampa’s Adam Humphries returned the miss 109 yards for a touchdown." "Thumb's down: The Lions haven't looked good at all this preseason, and that falls partly on Patricia's shoulders. On Friday, the Lions' first-team offense and defense got worked by a mediocre Buccaneers team, and they gave up a 109-yard return on a missed field goal late in the first half. Maybe Patricia wanted his team to practice defending that play — he said he didn't, but he also showed Auburn's famous "Kick Six" to his team this week — but there was no reason to try the field goal Friday. No one should be too down on Patricia. This is the preseason and he's still feeling his team out. But the sloppy play has been tough to stomach. "The Matt Patricia era is going to open under a cloud of uncertainty about whether his team is ready to play. There's no getting around that now. Not after the way the Lions opened the preseason in a sloppy loss against the Raiders. Not after they failed to correct mistakes in a beat-down last week against the Giants. And certainly not after a 33-30 win on Friday night against the Tampa Bay Buccaneers -- a game they trailed 20-6 at the half, and 27-6 by the time starters began departing the game in the third quarter. Yes, preseason games are meaningless. But this was the dress rehearsal. The Lions (1-2) watched film this week. They had a game plan, vanilla as it might be. Starters played into the third quarter. And they were shredded. After allowing a 17-play touchdown drive last week, the starting defense opened this one by allowing an eight-play touchdown drive. And Jameis Winston didn't even start." "You can worry about the red-zone offense, though. That was a struggle last year, largely because Detroit couldn't rush the football anywhere, let alone in those confined spaces. And this game offered no reassurances. The Lions drove inside Tampa's 10-yard line on their first two series, but were stopped both times. LeGarrette Blount got two carries on the first one, but netted no yards and Detroit settled for a field goal. Ameer Abdullah got a first-down carry inside the 10 on the next series, but lost a yard. For those scoring at home, that's three red-zone carries for zero yards. And once Stafford missed Golden Tate and Kenny Golladay, Detroit had to settle for another Prater field goal." 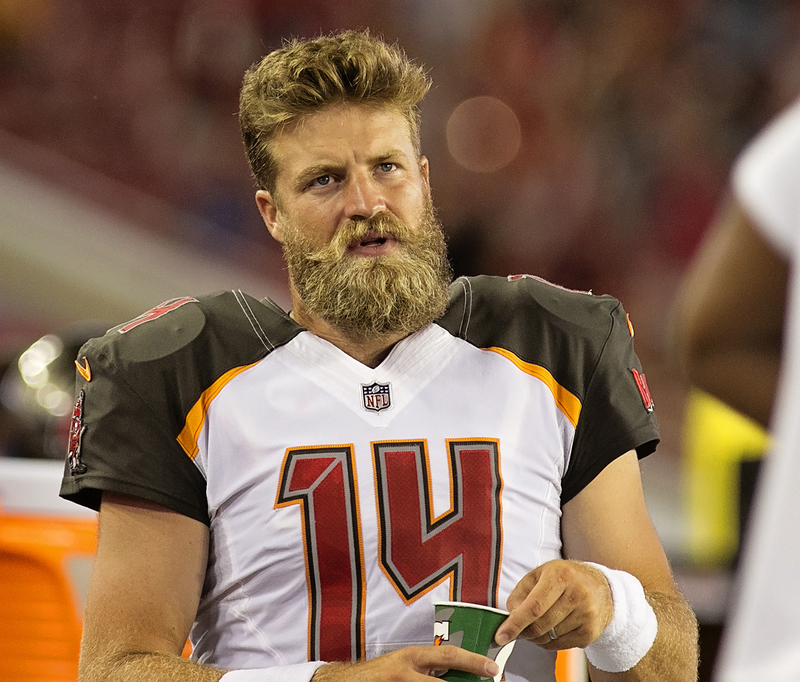 Offense: The biggest question going into the game for the Bucs was the play of Ryan Fitzpatrick, the team's starting quarterback for the first three games. He was precise, hitting six of seven passes for 82 yards. After a mediocre performance against the Titans, that was nice to see. Fitzpatrick isn't likely to be the player of the week in his starts, but if he can be a point guard, it will help. 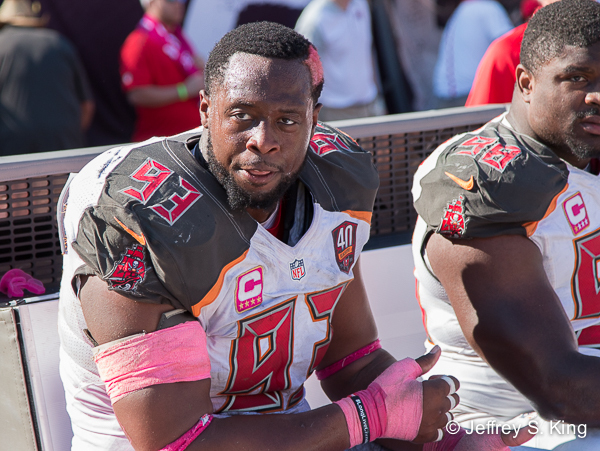 Defense: Will Gerald McCoy lead the Bucs in sacks for the sixth straight season? That's a lot to ask of an interior lineman, but McCoy had another one Saturday night. He's 30 now, and he has more help on the edge. But if you're betting on the team's leading sacker this year, McCoy isn't a bad bet. Special teams: It can be no one else but Adam Humphries, whose 109-yard kickoff return helped fans withstand the rain. Shaun Wilson dessrves mention after averaging 26.6 yards on five kick returns. That, ladies and gentlemen, is how a kid makes a team. Quarterback: The top three quarterbacks of the Bucs all had quarterback ratings in excess of 100.0.That's efficiency. You'd might have liked to see more deep throws, as against the Titans. But the quarterbacks have had a solid preseason. Except for a rare throw here and there, there isn't much to quibble with. Grade: A. Wide receiver: It's the team's best position, so much that a good football player won't make it. The opening quartet of Mike Evans, DeSean Jackson, Chris Godwin and Adam Humpries are as good a unit as the Rays have had. Grade: A. Tight end: O.J. Howard flashed his potential on a couple of players Saturday night. That's encouraging, since a analyst once told me the Patriots' hidden strength was in its talented tight ends. Howard needs to stop pushing off, which he was called for once, but he can be a force. Grade: B+. Offensive line: Peyton Barber, the starting running back, ran well. The line gave up a couple of sacks, but other than that, it gave the quarterbacks enough time. All in all, not a bad performance, although depth continues to be a problem: Grade: B. Defensive line: The Bucs had three sacks (two by the line) and controlled the running game, especially in the red zone. Still, a Vita Vea sighting would be good. Grade: C+. Linebacker: Both Lavonte David and Kwon Alexander had moments, but you'd like to see more of them. Grade: C.
Secondary: Too many quarterbacks have had high rankings against the Bucs, who don't make enough plays downfield. Grade: D.
Kicking: Chandler Catanzaro missed an extra point, but he made up for it with a field goal. Still, extra point misses can be deadly. Grade: C-. 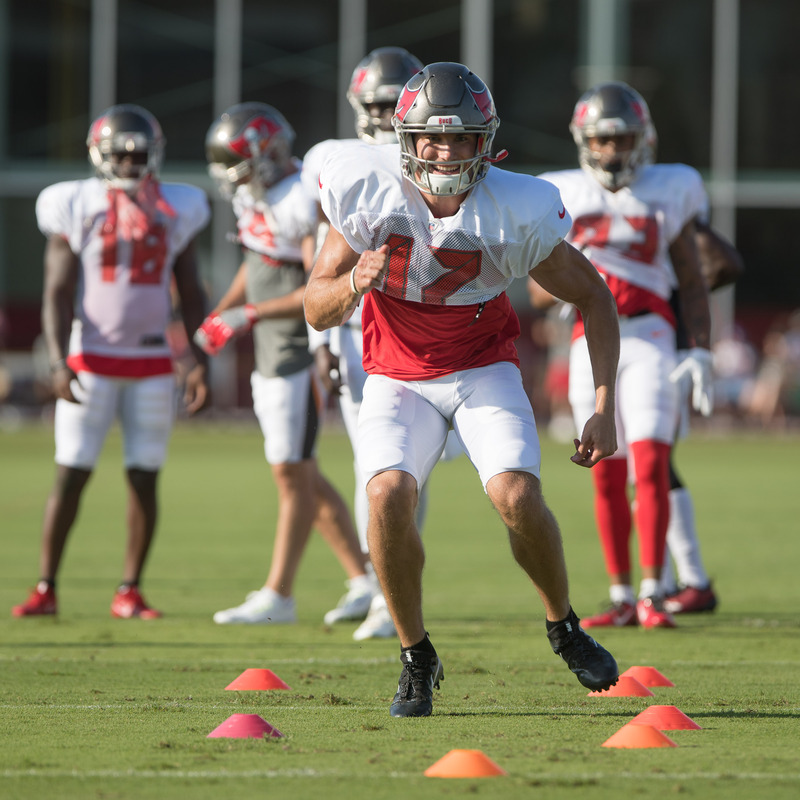 4-12-44 -- Adam Humphries' winding 109-yard run with a missed field goal was the most fun of the preseason. 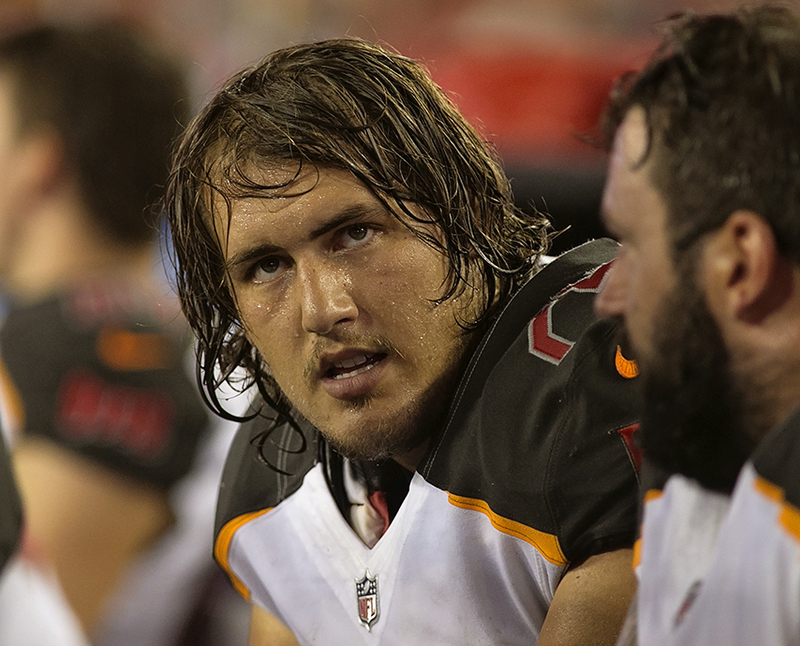 3-5-37 -- One play before the return, Gerald McCoy sacked quarterback Matt Harrington for a seven-yard loss. Without that play, the Lions aren't kicking a 62-yard field goal. 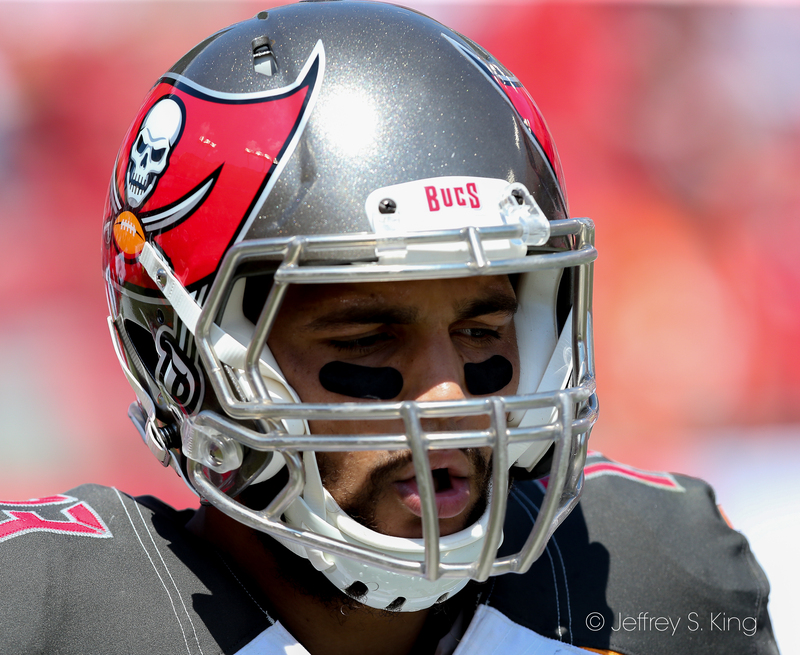 3-1-14 -- The Bucs need to improve in the red zone. This is the way they do it. On third and one, Peyton Barber bounced outside and rambled 14 yards for the touchdown. 2-1-40 -- Ryan Fitzpatrick hit tight end O.J. Howard for a 17-yard completion. 4-1-21 -- Jameis Winston looked to throw, then ran for the first down. He went seven yards before flopping awkwardly, but he picked up the first down. 4-4-31 -- Special teams are important, too. Just ask the Bucs, who gave up an 80-yard punt return to Brandon Powell. 3-14-26 -- This shoiuld have been one of the Bucs' better plays. Fitzpatrick hit Mike Evans for 21 yards, but Evans was called (again) for pushing off. He didn't need to. 1-10-36 -- James Winston hit tight end O.J. Howard for 30 yards. But Howard, too, was called for offensive interference. 1-G- 5 -- The Lions scored their winning touchdown when the immortal Jake Rudock hit Marcus Lucas for a five-yard touchdown. 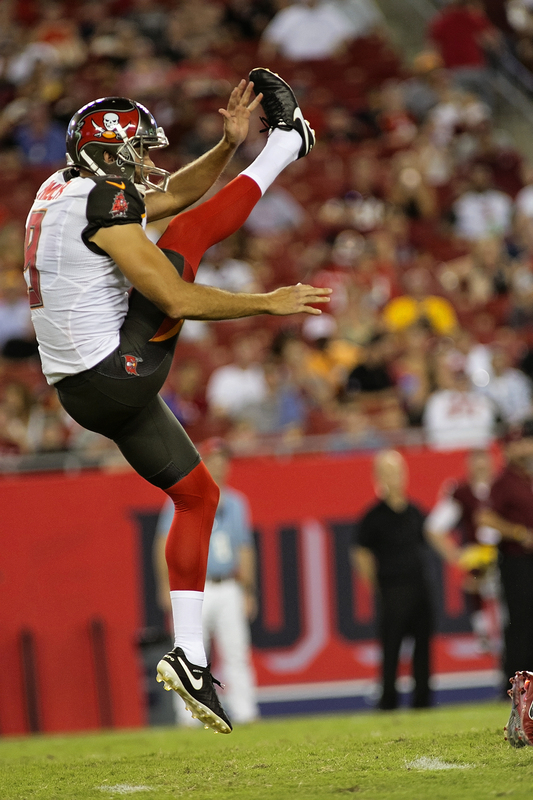 Extra point -- Chander Catanzaro was wide right. That kind of thing can cost a team. (In honor of Humphries 109-yard return of a missed field goal). 1. Derrick Brooks put the lid on the Super Bowl with a 44-yard interception for a touchdown against the Raiders. 2. Michael Spurlock became the first player in team history to return a kickoff for a touchdown in a regular season game, taking a kick back 90 yards for a score in 2007 against Atlanta. 3. Clifton Smith returned a kickoff 97 yards for a touchdown in 2008, the longest return in team history. 4. Also against Atlanta, Spurlock returned a squib kick for a touchdown. Spurlock has two of the three kickoff returns for touchdowns in team history. 5. Karl Williams was the best returner in team history, taking five punts to the end zone. His longest was an 88-yarder in 1996. 1. Bravo to the fans who withstood lousy weather, a delayed kickoff and a preseason football game Saturday night. Of course, where else can fans go to dance? 2. I continue to think higher of Peyton Barber. He hasn't had a lot of bad carries. 3. You could have a fine discussion over who will lead this team in sacks. I'm going with Gerald McCoy, because he always leads the team in sacks. 4. The Bucs have never had a lot of offense. They've been in the top 10 three times, two of them 10th and one eighth. That said, it's hard to believe there has ever been a Bucs' team with more weapons. I know the fourth-toughest schedule is daunting, but this team should be able to score. Glazers go long! 5. Does anyone else think that two games will be decided by the little things? Penalties, turnovers, injuries, kicking and special teams?